The bones of the mammoth which are found on the coast country of Bering Sea and in the adjacent interior are said to belong to an animal known as the kĭ-lûg′-û-wûk (ko-gukh′-pûk of the Yukon). The creature is claimed to live under ground, where it burrows from place to place, and when by accident one of them comes to the surface so that even the tip of its nose appears above ground and breathes the air, it dies at once. 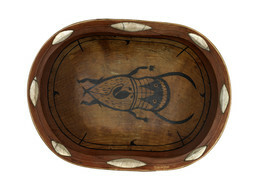 Edward W. Nelson purchased this Yup’ik bentwood bowl at Big Lake in the Yukon-Kuskokwim Delta. The painting depicts a long-tusked animal with human limbs, probably the mammoth-like underground creature that is described in Yup’ik oral tradition. Real mammoths lived in Alaska as recently as 5000 years ago and their bones and tusks are found eroding from river banks and along the coast. The story of the kĭ-lûg′-û-wûk may have arisen from finds of these remains, or from actual memories of the living animals, passed down through the generations.